Bonaire was featured in the June 9 edition of Huffington Post Travel. Entitled “Bonaire’s Top 10-Must See For Cruisers and Travelers,” Editor Sucheta Rawal highlights the top activities and sights visitors don’t want to miss for both cruise passengers and overnight visitors. This article is a direct result of Sucheta’s individual press visit to Bonaire in February 2015. To read this article click here. 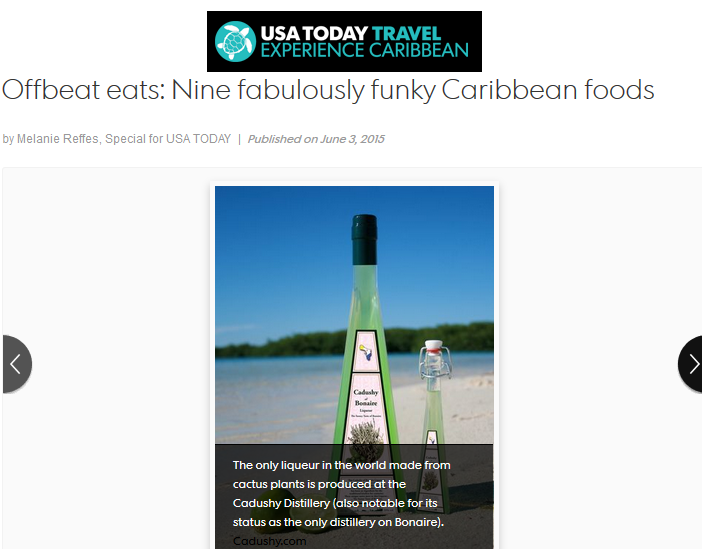 Bonaire was featured in the May 30 edition of USAToday.com’s 10 Best list. Windsurfing at Lac Bay was showcased as one of the best new sports to learn at the beach. This article is a direct result of freelancer Travis Marshall’s participation in our July 2011 group press visit. To read this article click here. Bonaire was profiled in USA Today’s June 3 online edition. 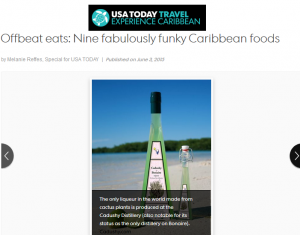 Entitled “Nine Fabulously Funky Caribbean Foods,” Cadushy Liqueur is showcased as the only liqueur in the world made from cactus plants. The “Awa di Lameoenchi” is featured as one of Cadushy’s signature drinks. Photos of the Cadushy Distillery accompany the write-up. To read this article click here. Bonaire’s Cuisine Month was a feature story in the May 7th edition of About.com Caribbean Travel. Entitled “Dine and Dive Into Paradise on Bonaire,” the launch of Bonaire’s 1st Cuisine Month was showcased. The article provides tips on where to dine around island, and highlights the variety of cuisine Bonaire offers their guests. To read this article click here. Bonaire’s Hang Out Bar at Jibe City was featured in the June 10 edition of Caribbean Journal. Entitled “Best Beach Bars in Caribbean,” the Hang Out Bar is highlighted for its relaxed atmosphere and chill vibes. To read this article click here.